The idea of providing what’s called a “Basic Income” for low-income individuals funded by the government is not new. But it’s a concept that has been gaining traction in the media, higher education, Congress and elsewhere. A Basic Income, or basic living stipend, is given to citizens as a regular cash payment using taxpayer money, BasicIncome.org explains. It is unconditional, has no means test, and can be implemented nationally, regionally or locally. Karl Widerquist, associate professor at Georgetown University in Qatar, spoke at Tulane University recently about the need for Basic Income. Widerquist, described by Atlantic Monthly as “a leader of the worldwide basic income movement,” asserts that Basic Income is essential “not only for people at the bottom but also for the average worker.” He told the Tulane audience that advocates can “remove the judgment and paternalism that pervade the world’s existing social welfare systems,” and offered options for paying for a Basic Income. Facebook co-founder Chris Hughes also argued recently that workers in the U.S. could receive a Basic Income of $500 per month if Congress repealed President Donald Trump’s tax reform. On MSNBC’s Squawk Box, he argued that less than one-third of Americans have benefited from the 2017 Tax Cuts and Jobs Act. Hughes, author of “Fair Shot: Rethinking Inequality and How We Earn,” argues that providing a Basic Income to low-income individuals would “rebalance” the economy and create economic growth. “If we invested in the American people, we would see economic growth,” he said. U.S. Sen. Kamala Harris, D-Calif., recently introduced the Lift the Middle Class Act, which would provide monthly payments of up to $500 per month to low-income families in addition to the benefits they already receive. It would be paid for by repealing the Trump tax cuts, she said. Basic Income payments are made in cash (rather than in kind), paid to individuals (rather than to households), and obligation-free. Before these recent efforts, a privately funded 18-month pilot program was launched to distribute a Basic Income in Stockton, Calif., which will begin in early 2019. Chicago Mayor Rahm Emanuel also announced the creation of a task force to study a Basic Income in the Windy City. The Heritage Foundation, however, points to a failed experiment conducted in six states from 1968 to 1980 that indicates a Basic Income isn’t viable. It points to a program administered by the federal government, a “negative income tax” experiment, which guaranteed a minimum income to a specific group of people. One goal was to determine if such assistance would help increase employment and quality of life metrics. The format involved reducing benefits as earnings increased. The outcome showed the opposite of the intended effect. Vijay Menon, research assistant for Domestic Policy Studies at The Heritage Foundation, said the negative income tax reduced “desired hours of work by 9 percent for husbands, by 20 percent for wives, and by 25 percent for single female heads of families.” Single men who were not heads of households and received the stipend worked less, on average, by 43 percent. Recipients who experienced unemployment during the experiment were unemployed for longer periods of time than unemployed non-participants. For every $1,000 in additional benefits recipients received, the results showed an average reduction of $660 in earned income. In other words, $3,000 worth of government benefits was needed to increase an individual’s net income by $1,000, Menon adds. Menon clarifies that the results of this study, and others, show that receiving unconditional aid, and not the phaseout of benefits, caused a reduced work effort. Adopting policies that discourage work is not good for America, he argues, and the majority of Americans polled on the issue agree. According to a 2016 General Social Survey, 70 percent of Americans agreed that they would enjoy working in a paying job, even if they didn’t need the money. “Policy should be designed to reward work, rather than replace it,” Menon says. 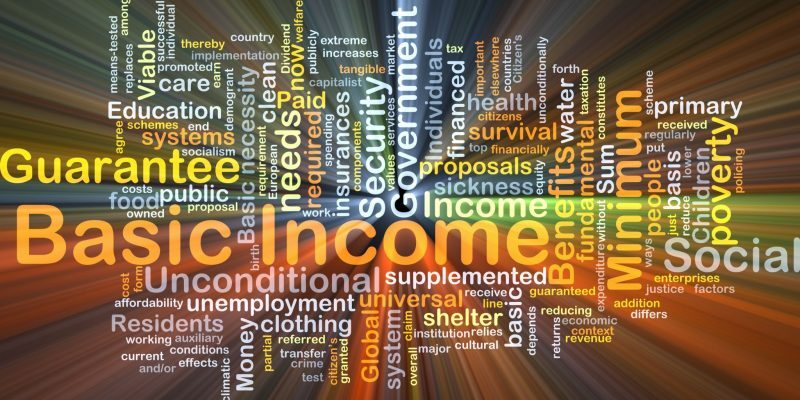 The Heritage Foundation recommends a better alternative to a Basic Income is revising and expanding the earned income tax credit. The former significantly reduces work and increases dependency, the latter values dignity and self-sufficiency, it maintains.